How to always save a file in XLS format in Microsoft Excel 2013? This article will explain how the users can always save the excel workbook in XLS format in Microsoft Excel 2013. The users can set the default Save As format of the excel workbook to XLS format (Excel 97-2003) format. Follow the below steps to know how to save the excel workbook always in XLS format. 1. Launch Microsoft Excel 2013. 2. Click “File” -> “Options” in Excel. 3. This will display the Excel Options Dialog. In the left sidebar of the “Excel Options”, click Save. In the “Save workbooks” group, Select “Excel 97-2003 workbook (*.xls)” from the Save files in this format DropDownList. 4. 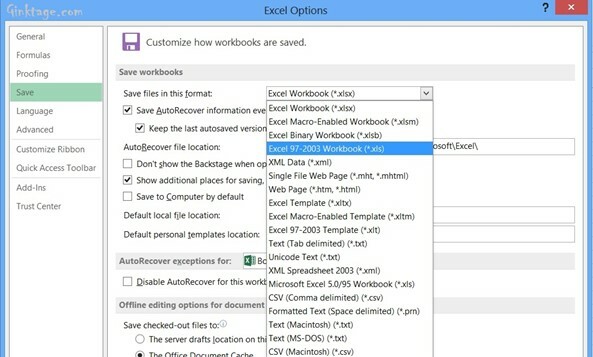 Click OK. Now, when you save the excel workbook, it saves in the XLS format by default.